You may not see them on the screen, but their influence extends to every set and every scene in your favorite movies. In the last few years Katie Spencer took the role of set decorator on such wonderful productions as “Pride & Prejudice”, “Atonement”, “Miss Pettigrew Lives For A Day” and “Sherlock Holmes”. In this conversation she talks about the craft of set decoration, taking a closer look at the artistic and financial aspects of movie productions, supporting the main story while not drawing too much attention to the set objects and, in particular, her work on the movie “Hanna“. Katie: I went to drama school in London in the early eighties to do the stage management and technical course. Then I worked in theatre for a few years, and while at The Royal Court Theatre I answered an advert in the UK “Stage” magazine for trainee buyers at the BBC. I trained as a freelancer at the BBC doing different buying jobs on a variety of programmes, and then transitioned from television into film, from buying into decorating as a natural progression. Kirill: What is set decoration? Katie: It is what you make of it. To me the most important thing always is the script, whether it came from a book, or an original screenplay the development of the characters within their environment is paramount. It’s all about the different characters. People may live in exactly the same time 2012 and be roughly of the same age, but they will never live in the exact same environment. To me, it’s making the written script come alive with the background, enhancing and not overshadowing. 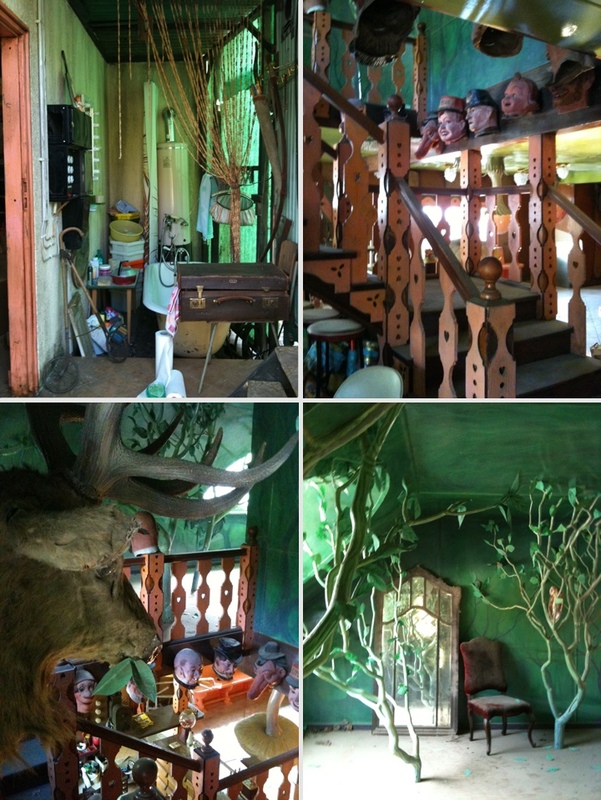 Set decoration is making the environment and the characterization work from t he script. Kirill: Do you ever get scripts that go very deeply into describing the environment? Katie: It’s very rarely that a film script would describe the environment in detail at all, unless it’s something very specific about a certain small prop that is essential to the narrative. Normally it would be along the lines of “He is a vicar, he lives in an 1880s vicarage, and needs to have a drawing room, a sitting room and a bedroom etc.” So there’s always a lot of freedom, which is lovely. Therefore you have to have an understanding of the character because there is little written in the way of stage directions of how this person would live. Unless it’s a big stunt sequence . Even careful storyboarding has little information about the background details. Kirill: So within this freedom, how do you research the specific period? Katie: If it was something that absolutely happened, then you have a duty to be as accurate as possible. like the Dunkirk beach sequence in “Atonement”, myself and the production designer Sarah Greenwood went to Dunkirk to see the town and its history for ourselves. Back in the UK we spoke to the veterans, and researched the war museums – portraying a story that is very near history comes with the responsibility to be authentic. And if it is “Sherlock Holmes” which is pure fiction, or “Hanna” which is contemporary, but fiction as well, you would still go to museums etc and the process is the same, you read, you get as much as you can from anywhere. Picture references are invariably the best type of research. Kirill: Most of your movies are period productions. Do we get to see the original artifacts, or mostly replicas? Katie: It’s nice to use authentic furniture, dressing and small props as much as possible, because there is something very exact about them as they bring their own histories and stories. Also you’re going to see them – a pen or a wallet – on the big screen in the cinema at ten times its real size, and authenticity then is invaluable. However sometimes they just don’t exist or aren’t available anymore and that’s when they become expensive prop makes. Or you have to or would want to make the furniture and drapes anyway because you can’t get them in the color or fabric scheme that you need. It’s a mixture. However it is nice to use as many authentic pieces as possible, and then bring in what you have made to further enhance the visuals. Kirill: Does the complexity of your job scale with the overall budget of the movie? Katie: It does to a certain extent. Obviously the bigger the budget, the more opportunity and scope there is. But sometimes when you have a smaller budget, it can be more complex and difficult because you don’t have that money to buy your way out of trouble, the “get out of jail” money as we call it. It’s always better to have money than not, but it doesn’t mean to say that the complexity is more. It’s very dependent on the film you’re making and there is never enough money no matter how much you have. It’s always tricky, always a difficult balance of money and time. Kirill: Does it happen that you buy an item that caught your eye for an off chance to use it in your next productions? Katie: You do sometimes, especially if you know that something is coming up when you don’t have so much money. So you buy it thinking that you can use it, but usually at the end of a tough shoot even things you loved at the time you just don’t want to see it again. You close the door on that and leave it behind you. I don’t have a store for things that I use again and again, just a few favorite items. Kirill: Do actors sometimes bring family memorabilia? Katie: I’ve never know that, and I would never advise anybody to bring anything of a sentimental value to a film set. Occasionally things go missing and the chances are that it will be that precious item that will get lost. Kirill: After working on period productions, what was different for “Hanna” in the way of research, where we don’t have any special expectations apart from it being roughly modern? Katie: I look at all films as set in their period. We’re living in a period now, and I think that modern is quite hard to do, and to do it well. The audience has much more knowledge, and you have to make them believe in the environment. When you’re doing something from 1780, not a lot of people are going to say “I wouldn’t do that”, but if it’s something set in 1980 onwards then they would. But from my point of view as a set decorator, I don’t live in a house that is completely 2012. I have a mixture of contemporary and some period items. So again it comes back to the character. We did “Hanna” and we also did a film in the States called “The Soloist” which was contemporary and was set on Skid Row in Los Angeles. The visual can be wherever you want to take it, apart from so many more computers, mobile phones etc in contemporary. It becomes more technical, which is great if you love that. Kirill: Do you feel that you sometimes shape the viewers’ perspective about the specific era? Kirill: Does it happen that you’re requested to draw inspiration from another production that the film director particularly likes, essentially extending the visual influence of that film? Katie: That does happen, and it happened more in the early television days, when you’ve strived to have something out of the little you had. But now because of the Internet and because research is so much easier now where you don’t need to travel half a day to the photographic library, I think that people are more independent rather than trying to recreate the look we saw in a film before. It’s easier to find the references and new ideas. Kirill: Let’s talk about the specifics of “Hanna”. The opening sequence is the isolated environment, with vast spans of snowed forest in an abandoned winterland, going from the cold blue colors of the outside to warm golden amber yellows on the inside. How did you approach defining this look? Katie: “Hanna” was a fascinating contemporary film to do because of her journey. There was a certain amount of rewriting in that script. To get to the starting base, you think about the whole arc and where she ends up. The cabin was the first thing we shot. And to get that cabin right, or as right as we could, to make her journey believable was quite tricky. First, we had to build it where we thought would be snow, and when there came time to shoot, there wasn’t enough snow. So we shot the opening sequence with the deer in Finland, as it was a very mild winter in Bavaria. There were many discussions about the look of the cabin, what it would be like, whether it would be more like an Inuit cabin or a teepee. And then we’ve realized that they had to have lived there for ten years at least, and you think how much they would have foraged from the outside. She couldn’t live in a sort of 20,000 BC world which is not modern at all, otherwise she couldn’t survive when she goes from it. So we decided that he [father] would forage and steal things from the local towns, and there is a mix of very simple and primitive, like cooking on a spit, sharpening stones and crossbows, but they also have a gun and books. Hanna had to have an understanding of the outside world. It was a fine line between being contemporary and really naive, but still believable to make it work for the action of the story. There was a lot of research into cabins from all over the world. Then we settled on a more traditional Northern European cabin and built it – as much as possible – in a naturalistic way. We made the candles to look like they came from the wax of the animals, made the characters reuse tin cans, construct their furniture from found objects and so on, it was really an interesting set to do. Quite tricky too, because you need the surprise of the modern era elements coming in, when Erik brings out the machine that alerts Marissa. Hopefully we’ve found that balance between her naive life, and not being too unknowing of the outside. Exterior and interior set details. Courtesy of Katie Spencer. Kirill: As you said, you’re planning the sets to serve the overall story. After being held in a very high-tech detention facility with very little control over the environment, Hanna next goes to a very primitive Moroccan hotel room. This was one of my favorite sequences, being very much set-driven with the appliances behaving like actors, springing to life and practically confronting her. What was the process of planning and shooting this sequence. Katie: We actually did it in Morocco. It was adjacent to the hotel, a sort of an empty shed used to store old cars. The idea then became to keep it as a store room but have one of the spaces for people to sleep. It was written as hotel room, and that’s why it had a shower, a fan and a TV – coming on to frighten Hanna. Keeping these elements in but setting it in a store room made for difficulties. It worked and didn’t work. It worked for how the rest of the hotel played, but it was quite difficult to accomplish, to get all these objects in there and in there for a reason. Into this revised setting we had to create an environment for the caretaker and for Hanna, to make it a cross between the Arab world and the western world where everything comes alive to frighten Hanna. You don’t see so much of it in the movie, but part of the set was filled with product placement items that we got for free on a very tight budget. Orangina is this little bottle, it’s very African and it’s very European. And very orange and very odd, very Hanna. So she had this little bed in the corner, and set decorating is very much about taking away and not only putting in, so sometimes you need to see very few things and that tells just as much of the story. Actually the wiring was so bad in Morocco, it was actually quite dangerous when the fan was turned on and the lights were going on and off. Saoirse Ronan is such a good actress and she can convey so much with her look, but it was very tense as it had its own inherent danger. Kirill: Is the final movie close to the actual set? How much was changed in editing and post production? Katie: We had very little time and money to do reshoots, so you see what is actually there. Paul Tothill is a great editor and Joe Wright is a very clever director. They have a gift of assembling it all brilliantly, as we didn’t have the leisure of extra time or extra money. Kirill: How does your usual day go? Are you on the set as they shoot, making sure that things stay in place between the takes? Katie: There are so many sets, quite often up to eighty. Therefore we’re often working ahead of the shooting crew. Say, at the first day on the Moroccan set we would see Joe [Wright] in, see the actors in, see the first take, make sure everybody’s happy. There is a standby art director on camera who is there all day every day with the shooting crew because we have to move on and do the next set. As nice, or as not nice to be with the shooting crew every day, we don’t have that luxury. Kirill: Hanna goes through the different environments, from an isolated cabin to the high-tech detention facility to the Moroccan hotel to the “regular” apartment where her grandmother lived. And then suddenly she goes to an almost fantasy world of an abandoned amusement park, with the wonderfully designed Wilhelm Grimm house. Is this intentionally forcing her to the different facets of the outside world? Katie: Sometimes you find a location that was not written in the script. We found this amusement park on the eastern side of Berlin, and it got rewritten into the script. We built a lot there, and it was the most phenomenally unusual place, last used around 1981. At the end “Hanna” was constantly being revised, mainly for budgetary reasons. There was a different ending at one point. There is this fairytale feel about it – to bring in this amusement park and the Wilhelm Grimm side of it. That was the case of a location leading the script. We built the Grimm house, we built certain things like the wolf’s mouth, and it just added to the whole fairytale element of Cate Blanchett being the wicked witch and Saoirse on her journey. It was great fun to do. Kirill: Did you find this location before the shooting started? Katie: It’s all before you start shooting. You have around 12-week prep where you’re researching. You have to have all the ideas before you start shooting. When you start shooting, the horse is out of the stable and you have to keep up just ahead of the shooting crew. Sarah [Greenwood] the production designer goes on provisional scouts with the location manager, and I would often go with her. After the provisional scouts the director would then join to be shown what locations have been found. We scouted different places, for all the different possibilities of the script that wasn’t quite finalized. And this is when we came upon this abandoned amusement park and it was just so visual that it was impossible not to use it. Kirill: What happened to that Grimm house that you’ve built? Katie: There was some debate about it. There was some legal problem with the amusement park about who owned it, and the history of bankruptcy. The person who owned it wanted to keep it, as it was good thing for him as ideally he would’ve liked to open the park again, but the reason why it failed to begin with was because it didn’t supply any car parking and there was no train station in the vicinity. Once the Berlin wall came down, it was a whole different ballgame anyway. He wanted to keep the house, but there health and safety issues – which are everywhere. We had built it as a film set. It wasn’t safe enough for an amusement. So I believe it was taken down, but there were still discussions as we were leaving Germany. But normally all the sets are taken down, and very few are kept. Various parts of the Wilhelm Grimm house set. Courtesy of Katie Spencer. Kirill: Where did you spend the most time on this movie? Katie: The cabin was tricky. Morocco was tricky, especially logistically. We did this camel market where Hanna walks through on her way to the hotel. We were in a dry riverbed, we had dressed the market, berber tents, stalls everything. Now we were waiting for the 200 camels garnered from 100s of miles around all of which had to be walked in, because there was no transport. Sometimes you feel very lucky to be doing what you’re doing. You travel, and it can be stressful, but I will always remember that early morning as I was thinking whether the camels were going to arrive, will we get only six of them, and they will be shooting in a couple of hours, and then suddenly over the hill came these scrawny animals – working camels, not tourist camels. It was one of the most remarkable experiences of my life as the sun came up and all these camels, two hundred camels coming over the hills our way. It was wonderful. So logistically even when there are no walls on the set it is quite tricky. The Wilhelm Grimm house wasn’t that tricky. In a way you had a template there with the amusement park, so it wasn’t the hardest. Sometimes what seems to be the simplest sets are the hardest to do. Cate Blanchett’s apartment – because we couldn’t find the right location for Marissa (finding America in East Berlin) and we wanted to keep it as bleak and neutral as possible. Things that you don’t think will be simple end up being difficult, and things that people go “Wow” were actually quite fun to put together. You can never tell. Kirill: After “Hanna” you worked on the second installment of “Sherlock Holmes” and now on “Anna Karenina”. As you said everything is a period production, but you are going back to earlier periods. Is there any special treatment to sequels where you want to maintain some visual continuity? Katie: It again goes back to the script. With “Sherlock” he is still living in the same house, so of course we had to redo it. 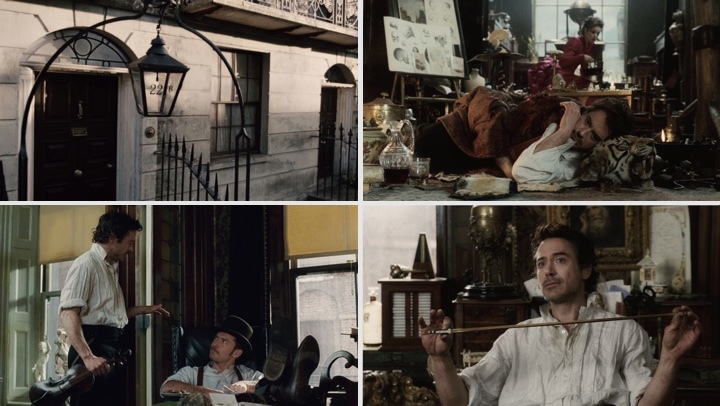 For the first movie we built the interior of Sherlock’s house on Baker street in New York, because Robert Downey Jnr needed to be in New York. Now we had to recreate it and build it here in the studios in London. You follow the script, and the script for “Sherlock Holmes” is always completely bonkers and is always being revised by Robert, Jude [Law] and Guy [Ritchie] with a lot of improvisation. In this script he turned the apartment into a jungle and you think “How is that going to work, what do you mean it’s a jungle in there?” That’s difficult to do, because you don’t want it to look like as a period house with a few rubber plants in. We also had many sets built that were meant to be in Paris or Germany, and a chase across Europe. Doing “Sherlock Holmes” is not like doing any other film because you get a very free hand which is lovely, but you are never quite sure what will come out of the rewrites. But it’s fun and entertaining. Kirill: Do you tweak the production and visual aspects on the look of the specific actors, things like skin tone or physical frame? Katie: It does. Skin tone affects the colors of the walls and similar things. Physical frame is an interesting thing. If you’re doing Gollum’s house, you design it around what Gollum is. And to another extreme of Father Christmas’s house, it would have the matching aspect. It does manifest how they carry themselves and what they look like. It’s really important to see who’s playing the parts. Quite often the supporting cast comes in after the major casting is done, and you need to know whether Marissa in “Hanna” is going to be Cate Blanchett or Judy Dench. It puts a whole different slant on how they would live and what they would wear. Costumes are very important, because what you wear is often reflected in how you live. Kirill: Do you think that actors bring certain visual heritage from their previous movies? For example you worked with Keira Knightley on “Pride & Prejudice”, “Atonement” and now “Anna Karenina”, and she’s in a lot of period movies – do you expect the audience to expect her to look in a certain way? Katie: Keira is quite a good point, because she does do a lot of period films. She’s been asked many times about this, and she’s said it’s because of better scripts. We’re not quite finished with “Anna Karenina” and we’re actually going to Russia at the end of the month to do more shooting, chasing the snow again. So you know you’re doing the beautiful Anna Karenina and then you talk to makeup to find out she’s going to be slightly different, also being older than Vronsky is another interesting aspect. Having worked with Keira you also know how she works within sets and that’s really helpful. Robert Downey Jnr is very interested in how his character lives, more than anybody else, I think. He’s very methody in that way, and he would take something from the Baker street set and use it as one of his continuity props. Knowing that made “Sherlock Holmes 2” a little easier since I knew how he works. Kirill: Going back to Gollum, he is not a real physical character, but rather motion capture further enhanced and brought to life in an advanced computer-generated environment. Do you see virtual set creation and manipulation encroaching on your turf, being something that you adapt to and help shaping? Katie: I think that if it continues that way, it will encroach on everybody’s turf. I think it will be the hardest for art directors as opposed to production designers because they will always have the overall view of the look and visual effects. It will still affect set decoration, but as the actors still have to interact with their immediate environment hopefully there will employment for us. There’s a place for it and it’s absolutely fabulous when it works well. When CGI and non-CGI melt together you get a brilliant effect, but it can also be overused. I think that teenagers especially get bored of CGI if it’s not done well. If you would’ve said this to me years ago, i would’ve thought that CGI would come further and there’d be more CGI films – like “Sky Captain and the World of Tomorrow”. Perhaps because we’re going through a period of recession it seems to be more nostalgic coming back to more traditional film making. If I was offered a completely CGI film to do, and a normal film, I would go for a normal film. When it does work as a set extension, enhancing sets on a traditional film, it’s brilliant. But you shouldn’t be aware that there’s CGI anywhere. You shouldn’t know where one ends and another begins. You shouldn’t lose the magic of it actually being done in camera. Kirill: Did you do any set augmentation in the second installment of “Sherlock Holmes”? Katie: We did the exteriors of Baker street in London, we build a Paris cafe with the Eiffel Tower behind. This is where CGI is nowadays in period films – cityscapes. We had brilliant people doing CGI and it works well. It was the most CGI of any of my films, and it’s just the nature of this film really. Kirill: Are there any particular productions that influenced or impressed you over the years? Katie: If you see any Coen brothers film, you just know it’s going to be beautifully realized for the story, for the character, for whatever period it is set in. I also love Ang Lee films, and he takes real challenges going between one and the other in different genres. You can’t not look at the sets, and you recognize different things. And now we’re in the middle of the voting season [Oscars], and with all the DVDs you just forget and get mesmerized by something – that’s the best thing of all, really, when you’re just a viewer. I love all films, the 40s, the 30s, and some silent films. They’re visually stunning. And here I’d like to thank Katie Spencer for finding time in her busy schedule shooting Anna Karenina to talk with me about her work. Her latest movie, “Sherlock Holmes: A Game Of Shadows” is playing in the theaters, and she’s in the middle of shooting “Anna Karenina” which continues her collaboration with actors Jude Law and Keira Knightley, production designer Sarah Greenwood, art director Nick Gottschalk and supervising art director Niall Moroney. Also, special thanks to Sarah Horton for putting me in touch with Katie.